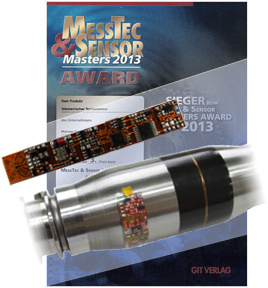 The award winning Manner space saving telemetric torsion sensor is a strain gauge with integrated amplifier and telemetry interface (Strain gauges are known for their precision and flexibility). It can easily be affixed on a shaft like a normal strain gauge and no soldering is needed, this saves labour time and thus money. The system is completed with a contactless pickup and receiver which delivers power to the telemetric sensor too.